Grizzled mug Serge Reggiani plays Faugel, an ex-con out to settle a score from when he was serving time. The film opens with the sound of his footsteps echoing under an overpass – the metronome of his life signaling his doom. He arrives at the home of a fence, Gilbert, who Faugel suspects of killing his girlfriend. 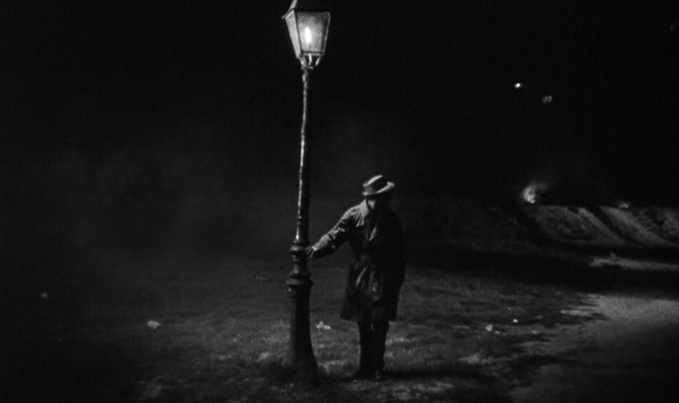 After an incredibly stylized and patient execution, Faugel buries the gun and some cash underneath a lamppost that’s seemingly in the middle of nowhere. It’s like a wasteland with one lone lamppost fated to have something buried beneath it. Enter Silien (Belmondo), an enigmatic drug dealer who hooks Faugel up with some safecracking tools and acts kinda weird around Faugel’s new girlfriend Therese (Monique Hennessy). Like most of Melville’s gangster antiheroes, Silien speaks and moves economically, with eyes that absorb everything. The only time he speaks passionately is when talking about the fancy house he’s having built where he can hang up his doulos and settle down. Despite looking to the future, Silien, like everyone else in the film, is living in the past. He can’t shake his former flame, for example, so he makes her new man the target of his manipulation. Like many classic capers, the plot becomes wickedly convoluted, with baffling twists and revelations up until its final, bloody minutes. I’ve seen Le Doulos a couple of times now, and I’m still unsure whether Silien is trying to convince his peers that he’s no snitch, or if he really is as tight-lipped as he brags to be. In a way, Melville is exploring the uncertainty of narration while deconstructing the classic images of crooks, favoring abstract gangsters instead. It’s well-known that Melville wore his love for American crime films of the ’30s and ’40s on his sleeve, particularly the classic noirs. Le Doulos is filled with borrowed elements, such as trench coats, large American cars, and fedoras, along with expressionistic mise en scene such as hard shadows and forever night. There are subtle touches diehard noir fans will be interested in as well: a toothpick-chewing cop lifted from Sterling Hayden in The Asphalt Jungle (as well as his love for horses) and replica wallpaper from Odds Against Tomorrow. Melville was also influenced by the fatalism of noir, which is easily my favorite aspect of the genre. His characters here are trapped by their surroundings, their identities split by shadows. The futility of the characters’ actions is marked by extreme pessimism – a trademark more of French cinema than American at the time. And like all of Melville’s gangster films, the focus here is on the men and the relationships between men. The themes he would emplore in his later films are present here – namely friendship, betrayal, and loyalty. So while Le Doulos is an impressive homage to American noir, but also a wholly original work of art. Melville always did Melville, no matter how many influences he nodded to. It’s a completely personal film that cemented Melville as a force in crime cinema, and he only got better from there with Le Samourai and Le Cercle Rouge.